The confusion around the role of the manager in an Agile environment seems to reach its peak just as teams start to exhibit real signs of self-organization. When managers see that they are no longer the driving force behind the work management, some conclude that they are no longer needed at all, and this can lead to rash behavior. Although completely understandable, I believe this erroneous conclusion is the sign of an over-reaction that needs to be addressed by the change agent. Until the world is completely teal and corporations "flat", great managers will continue to play a key role in many large organizations. In a self-organizing world, managers should no longer oversee every aspect of the work. Instead they should attend to the environment. Where the Product Owner focuses on the product, the manager focuses on high performing teams. Managers are to teams what gardeners are to plants. We would all have a good chuckle if we saw a gardener asking the tomato plant for a commitment on when its fruits will be ready, telling the cucumber where to stretch its vines, challenging the cabbage and broccoli to get rid of pests on their own, weighing and comparing the squash against objectives determined at the beginning of the growing season, and grandstanding in the middle of the pumpkin patch on the lofty harvest aspirations of the landlords. We would laugh, because we know that none of those behaviors will lead to results. However, in most corporations today, this is exactly what managers do. I don't believe this is what we want from managers anywhere, but it is especially damaging in organizations that are trying to embrace the discovery mindset. 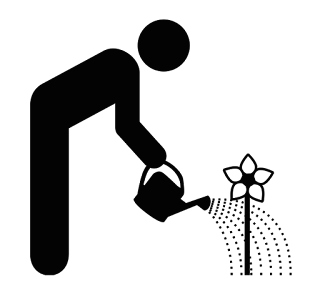 Managers, like good gardeners, must be responsible for the environmental conditions and trust that their people will maximize their own potential. Meters the amount of sunlight reaching the plants Interprets the organization’s strategy and gives people a clear sense of "true North"
I don’t know about you – and please feel free to give me your thoughts in the comments section – but that still feels like a lot of work to me. However, it’s a work of a different nature for sure; it’s more leadership than management. As such, not everybody will immediately excel at it. Nevertheless, I think the investment of energy in better leadership is well worth it. Also, isn’t it a lot more fun and ultimately impactful? Therefore, I think managers should view an Agile transformation with optimism. Gardening, Stephanie Wauters, Noun Project, Web. 1 Sep. 2015.